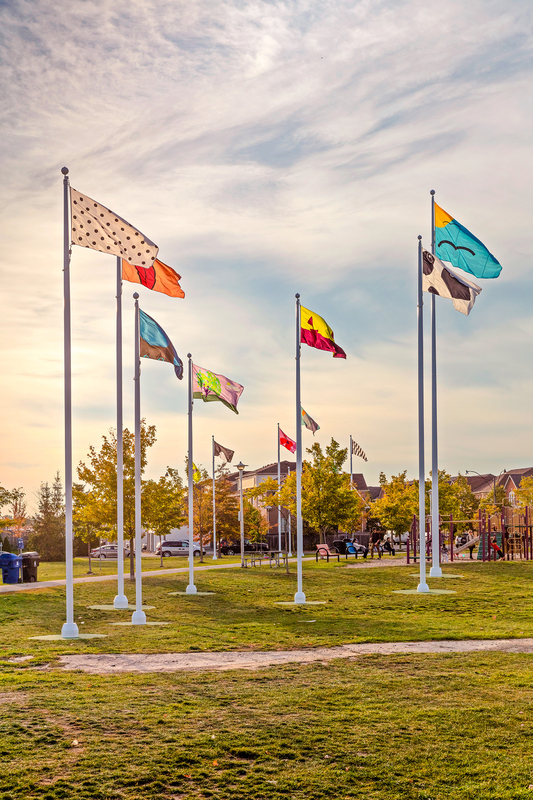 Flag Field is a public work by artist Josh Thorpe, located at Maple Claire Park in Toronto. 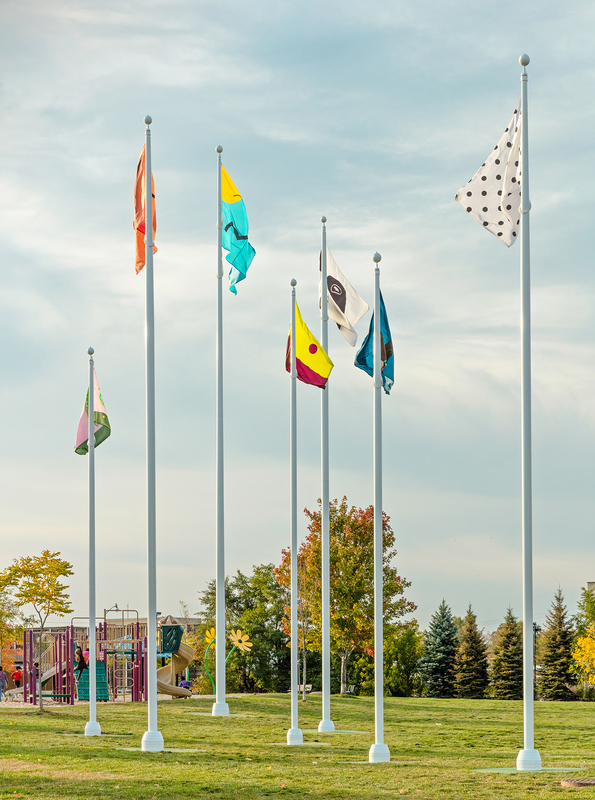 Flag Field consists of fourteen custom flags on flagpoles ranging from 25 to 50 feet high. Thorpe designed the flags as simple drawings of cats and dogs, stripes and polka dots etc. — images associated loosely with the leisure of parks. The flags are clustered in two groups adjacent to the main pedestrian path of the park, and are intended to bring movement and colour to the site, to partly screen the surrounding urban fabric, and to create a loose system in which people can stroll or children can play. The base of each flag is a circle of multi-coloured rubber crumb surface often associated with playgrounds and sports fields. 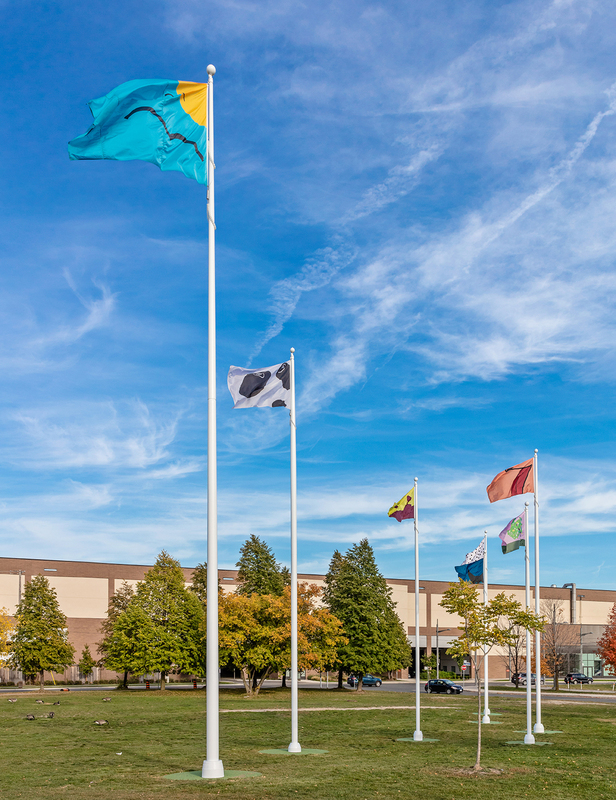 Each flagpole is underpinned by groundscrew technology, a light-touch alternative to traditional concrete foundations. The use of ground screws in this case is more economical, more time-efficient, and makes a much smaller footprint on the site. ERA Architects provided landscape architectural and project management services for this project, specifically early schematic design and concept renderings; consulting regarding view corridors and flag placement on site; construction drawings; tendering; and contract administration. Structural Engineering was provided by Blackwell and the use of ground screws was provided and installed by Aduvo Systems Ltd. They proved to be an economical solution to securing the base of the pole to their grounding.